Eight times twenty-five makes 200 tonnes of carbon and lead for a total of 200m of boats all thundering towards a 330m start line. With the squeeze for space on, there’s no room for error and every reason to watch what happens next. The game as played out today was not what many would have predicted. Act 3 of the America’s Cup kicked off today in a 12-14 knot breeze and a perfect display of a tight start with nobody fluffing the timed run into the line. The result was eight AC boats fighting for height and speed as they crossed the line, a photographer’s dream. But a few hours later after the second race, the day’s action had become a bit of a nightmare for some, especially BMW Oracle who turned in a fifth in the first race and a sixth in the second. The winners of Act 1 and the masters of the season so far are now lying fifth equal (sixth if you work on tie break rules). What on earth is going on with what looked to be the strongest team by far just a few months ago? Asking Chris Dickson doesn’t really get you that much closer to understanding what has caused this fall from glory. In the first race BMW Oracle rounded the weather mark in the lead. By the time they rounded it the leeward mark they had slipped to second and an ugly next beat left them in fifth at the second weather mark, a position they held until the finish. In the second race the team were last around the first mark after an incident with Le Defi at the start left them with a penalty to carry out shortly after they had crossed the line. By the end of the race they had pulled back to sixth. “It was one of those days,” he said, shortly after stepping ashore. “The team’s all in good spirit and the boat’s going just fine. We had a fourth (sic) in the first race where we’d been first at the first mark. It wasn’t a great race but it wasn’t bad,” he said. “The second race to have a penalty to do immediately after the start made it a tough one to come back from,” he continued. Wasn’t bad? Many might think this was a disastrous day for a team that has dominated the season. Having said that, we have seen this team turn the after burners on and bounce back, so if nothing else today’s performance will spice up the action over the next few days. Not that it needs to be. Another team who weren’t enjoying the scenery of other boats in front of them was Alinghi who kicked off the day with a fourth – again not the position we’re used to seeing them in. 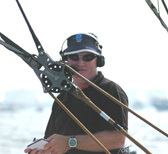 The second race saw a more typical performance when a slick replacement kite hoist, after the first one had blown out, was the most impressive piece of boat handling of the day. After a drift to the finish the Swiss finished second which leaves them in this position overall, a step in the right direction. “First we made a strategy to remind ourselves that we’re fleet racing, not match racing, and it’s a wide open fleet where anyone can do well,” said helmsman Peter Holmberg. But talk of the town today was of Emirates Team New Zealand’s win in the first, and a second in the second. No matter how much they might try to play down their success, this is a team that’s out to prove a point. “Today is just a continuation of the past two weeks,” said ETNZ tactician Terry Hutchinson. “We’re learning each other lot every day we go sailing. Dean’s doing a great job sailing the boat, which in turn allows me to do a great job tactically, which in turn allows all the guys to give the input that is going to help us make the right decisions. Elsewhere in the fleet there was cause for some smiles tonight as Le Defi scored a second and a seventh which places them in fourth overall, while Team Shosholoza pulled off a seventh and a fifth today. If you thought you knew what Act 3 had in store, think again.